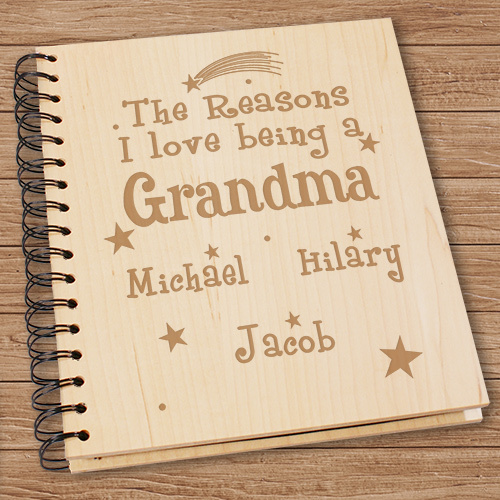 Enjoy our Personalized Grandma Photo Album while you show off why you love being a Grandma. Our Personalized Wood Photo Album measures 7 2/3" x 8 3/4" and holds 72, 4" x 6" photos. Includes FREE Personalization! 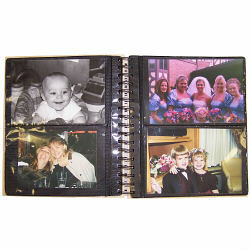 Personalize your Grandma Brag Book with any title and up to 30 names. May we suggest Grandma, Nana, Mom, Aunt Betty or any special title for your Personalized Grandma Photo Album. Wood Photo Album measures 7 2/3" x 8 3/4"
Amazing product at a great price. Received sooo fast! Grandparents will love this! I love the engraving it was a special gift for my daughter from her young sons. Made her cry! It is great to see what the personalized wording looks like before you order. Additional Details Personalized Photo Keepsakes make great photo gift ideas for Mother's Day, Father's Day, Christmas Gift ideas and Grandparent's Day.